The Red Cliffs Golf Club has been part of the Red Cliffs community since it was established in 1925. The club owes its existence to the perseverance and hard work of the soldier settlers that opened up the Red Cliffs horticultural district after the first world war. These hardy people understood that if they were going to get any improvements to their lives, they had to do it themselves. The soldier settlers that started our club were not afraid of hard work and were the ones that instilled the spirit of volunteerism into the club that still exists today. The whole district can be proud of the efforts of these early settlers who would not let adversity and tough times stand in their way. We hope that you enjoy finding out more about our great community golf club. The Red Cliffs town & district. The red cliffs on the river bank. The Red Cliffs Golf Club has been part of the broader Red Cliffs community since 1925, so it seems appropriate that the story of the club should commence with a few comments about the township and the wider community. 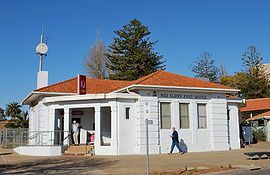 Red Cliffs is a very typical, medium-sized country town of some 2700 people at the northern end of Victoria's Mallee region. Its name derives, quite literally, from the colouration of the 70-metre cliffs that form the bank of the Murray River to the east of town. Red Cliffs is located on the Calder Highway, 544 km north-west of Melbourne, 16 km south of Mildura and 67 m above sea-level in the large irrigated horticultural district known as Sunraysia. Once occupied by the Keramin Aborigines, the area was settled by Europeans and a town was established. In 1918, it was chosen as the site of what turned out to be the largest soldier settlement ever developed in Australia. Land was cleared for a nursery where millions of vine cuttings were grown, then the 700 First World War diggers began to arrive. They cleared the mallee scrub and cultivated vineyards with a view to establishing a dried fruit industry. In order to draw water from the Murray up over the cliffs, the Southern Hemisphere's largest pumping station was built and by 1928 it was supplying 200 km of irrigation channels. It was these First World War soldier settlers that established the Red Cliffs Golf Club in 1925. After the Second World War, some of the original blocks were resold to the new war's veterans and the tradition continued. As you enter the township of Red Cliffs from the south it’s difficult to miss the large piece of machinery in Barclay Square, opposite the railway station known as 'Big Lizzie'. This gigantic machine was built for the original purpose of carting wool from the outback sheep stations in the Broken Hill area. Despite scepticism concerning its capacity to navigate the Mallee's sandhills, it reached Mildura without trouble, only to be stopped by the Murray River, which was in flood, and by the unavailability of a punt of sufficient size. Consequently the machine was used at Merbein for carting wheat (one load being 899 bags). When land clearing at Red Cliffs began in 1920, the Victorian Government hired the machine to uproot trees. In all, it cleared 1500 ha and made an important contribution to the conversion of the area into usable land. The Red Cliffs district has produced a wide range of horticultural crops since it was established as an irrigation district. In the early days the main crops were dried vine fruit and citrus. Although these crops are still grown today horticultural production has diversified to include wine grapes, table grapes, avocados, asparagus plus a wide range of vegetables and nuts. Follow the Red Cliffs Golf Club Story! To read the story of the 1900's and see some interesting photographs! This is where the club's story will develop overtime! The aim of this section is to capture the stories of individual members of the club. Several Life Members and others who have been a major part of the club over the years have been asked to record their 'recollections' of their time with the Red Cliffs Golf Club. Also included is a 'Short Stories' section where members, both past and present, can tell us about those incidents, both big and small, that happened at the club and the 'characters' that were involved. To read what the club's members, past & present have to say! The amalgamation of the two Red Cliffs based golf clubs. The establishment of grass greens on the course. The development of the lawn turf enterprise ........and more! Red Cliffs Golf Club by reading our story. Remember! this is not a history, but an ongoing and ever-changing story!